← Why are children crying about school? Can We Escape the Matrix? Many people are talking about what’s right and wrong with education; Luba Vangelova’s Steve Hargadon: Escaping the Education Matrix is a thought provoking position. Hargadon’s idea that we are in an “education matrix” of which many of us aren’t aware clarified my confusion over why people aren’t rebelling against this new wave of mandates. Why are intelligent people allowing the government to use our tax dollars inappropriately? Part of the problem is, unless a person is an educator, most American citizens believe the propaganda coming from media and big businesses that teachers are to blame for the state of education; therefore, most Americans support the current testing trend that is purported to weed out the bad teachers. However, the only thing this trend is doing is pushing out the great teachers and destroying our children’s individuality. The government is taking money allocated for education and giving it to wealthy textbook companies to create these tests. The result: Our tax dollars aren’t edifying our children; instead, our money is used to label our children as advanced, proficient, partially proficient, or unsatisfactory. Why are parents allowing this to happen to their children? As an educator, I have no idea how these labels help my students, and I have yet to see how these tests improve education. Instead, these tests are taking money out of the classrooms. Testing does not create self-reliant children. Testing does not help children reach their full potential. All state testing does is label our children and make them feel inadequate. As a parent whose child is struggling in school, I don’t need a test to tell me that. I know he is a struggling reader because of my interactions with him. I know he is a struggling reader because the diagnostic tests he takes at school confirm it; diagnostic tests identify weaknesses with immediate feedback. State tests are not diagnostic. They claim to be, but all they are is an expensive waste of time. State tests are usually administered in the spring, and the results don’t come back until the fall. How does that help my child right now? How does that help his current teacher find out what interventions he needs today? We need to decide, as a nation, what we want for our children and for the future of our country. Not all schools are bad, just as not all teachers are bad, but we are all paying the price for a top-down mandate, where non-educators are deciding what they want the majority of children to know. The students who are free-thinkers are the exception not the rule, and they became free-thinking individuals because they had educators who taught them to think for themselves, educators who largely ignored the federal and state mandates. They also had parents who encouraged them to think for themselves. Unfortunately, the majority of our youth don’t have these type of people in their lives. Hargadon’s point about “not [feeling] confident in being critical” is a little misleading. Contrary to what he says, we do have a lot of people who are extremely confident in their criticism, but their criticism is based on uneducated opinions, especially about education. The overly critical people are the ones who have never been teachers, who don’t understand children, and who think their opinions are correct because of their limited experiences as students. The majority of our citizens don’t do the research before they spew out their thoughts. It’s shocking how many tax payers believe that their money is best spent on tests and making publishing companies richer, rather than putting money into the classrooms or helping the impoverished areas provide health and nutrition for poor children or into the teaching profession to attract better qualified teachers. Parents have more say and control than they think. Not only do they need to take back some of their parental duties that they have too willingly given to the school systems, but they have to stand up for what they want their children to learn, what they want their money to fund. Whether you have children in school or not, remember, you are an American citizen, and what our educational system produces is your responsibility and will be your reality, one way or another. This entry was posted in Come Hell or High Water, Education Reformation, True Reformation and tagged Children, Education Reformation, Steve Hargadon. Bookmark the permalink. 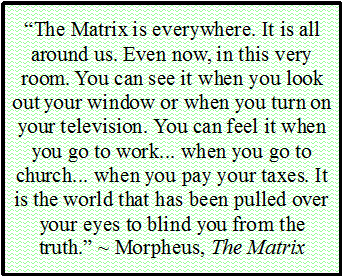 5 Responses to Can We Escape the Matrix? Great points. I read this article a little while and back and felt similarly. In the end, it is all about allowing our children to think for themselves. It begins by letting them make their own decisions at a very, very early age. Giving them time and respect to do things (almost everything) for themselves. Then, they will thrive in any environment, no matter how antiquated. As the author of the article, I just want to chime in about one thing you wrote. I don’t think there’s a discrepancy between what you and Steve are saying. Isn’t it the case that the people you describe are being critical in the way they’re TOLD to be critical, by those in positions of power? How much critical thought (using the other definition of the word “critical,” i.e., “involving skillful judgment as to truth, merit, etc.”) is involved? I believe Steve was using both senses of the word. Thanks for clarifying that, Luba. I understood what Steve meant and agree with it, but when I shared your article with a colleague, we discussed that the confidence with which many people share their uneducated opinions seemed to be another layer to what he was saying. It was the confidence part we questioned, not so much the meaning of critical. I agree. We are saying the same thing, and my choice of the word “contrary” seems to imply that I’m correcting him, when in fact I’m just adding another layer that I didn’t think was evident. Pauline, I have been longing to be involved with anything that will stop this horrible take over of our public schools. How can we all be involved ? Is it you who will begin the grassroots movement against this debilitating system? How can educators be so blind to buy into this, just for a paycheck ? What if every teacher in America took a day off all at the same time. Could this be a way to get their attention ? First, thank you for your confidence in me. I hope to inspire change, and if I can help others fight for change as well, then I have done a worthy deed. But I want to make it clear that most teachers (and many administrators) see what is happening and don’t like it anymore than I do. So many have confided in me that they wish they could do what I did, but they have their personal reasons for staying. There are teachers who have been teaching for a long time; it would not make sense for them to leave when they are so close to retirement and to receiving the benefits that go along with that. There are teachers who are trying to fight the changes from within the system; it is much harder that way, but they are still fighting. But most teachers stay in teaching because they are there for the children; they are making a difference in their lives despite the ridiculous government mandates. I resigned because I was moving to be closer to my family; I will not seek another teaching position anywhere else because I want to fight the system from the outside. I can have more freedom to advocate for public education and our children if I’m not afraid of losing my job for speaking out. I will still be involved with any of my current or former students if they need me. I hope to tutor future students because I can’t leave the profession entirely. As far as a mass walk out–I definitely think there is power in numbers. I’m not sure if coordinating such a thing is feasible, but what I would like to see happen is that more teachers boycott proctoring state standardized test; more parents opt their children out of state tests and protest at their state capitol buildings; more students take pride in their education and shun the labels the government wants to put on them; and more parents support and advocate for their children’s teachers rather than treat them with contempt. I think all of these actions could lead to change; we just need leaders in each state, district, and school system who will organize and rally people. You could do that locally if you have the desire. Thank you for wanting to defend our children and teachers! I appreciate your support!